I recently had the pleasure of visiting the Van Gogh Museum to view the exhibition, Van Gogh at Work, which chronicles the artist's growth over a ten year time period. Van Gogh at Work leads museum visitors chronologically through Van Gogh’s development as an artist, from his first experimental drawings to his famous later paintings. 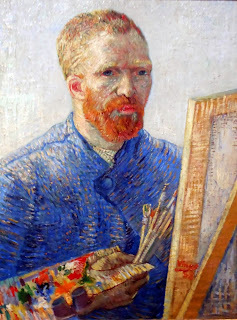 Most people are familiar with Van Gogh's bold use of color and painterly, emotional style (fig. 1). In this anniversary exhibition, more than 200 works of art, including paintings, works on paper, letters, sketchbooks, paint tubes and his only surviving palette, provide us with a unique insight into his thoughts and work process. The museum, located in Amsterdam, opened in 1973. It faces the Paulus Potterstraat and has its back to the Museumplein. The Museumplein, or, Museum Quarter, is the cultural hub of the city and home of Amsterdam's three most significant museums: the Rijksmuseum, the Stedelijk Museum of Modern Art and the Van Gogh Museum.